Yoga is increasingly popular amongst women in London (and the rest of the UK). The benefits of Yoga are endless – from helping with anxiety and stress to lowering blood presser and great physically benefits. 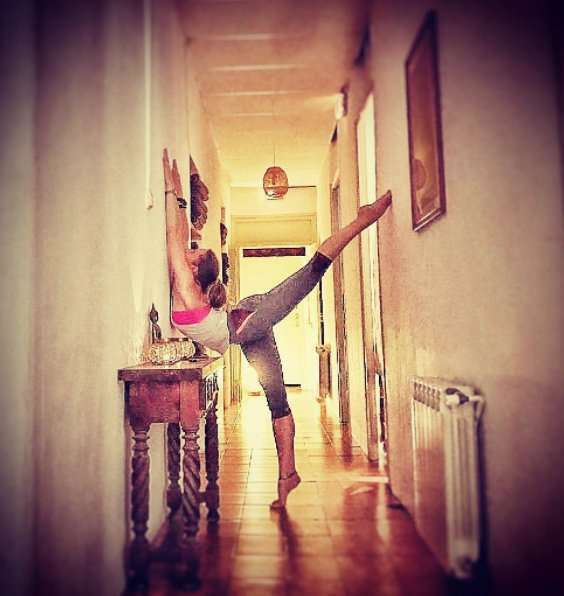 Yoga is unsurprisingly popular, but what does it take to get hooked on this magical exercise?! Growing up I had always been “the performer” – being centre stage at any given opportunity and trying to be the best at whatever I did. I didn’t start formal dance training until my early teens though, which meant a lot of catch up work with these prima-ballerinas and unfortunately, I think the pressure of conforming to trying to be the best here, encouraged the development of eating disorders.�I tried however, to focus my food and body obsessions on being as health conscious as I could be, rather than skinny conscious. I learned all I could about the body, about nutrition, and could usually be found in the gym between college classes. It wasn’t until my 1st year of professional theatre school training that I was properly introduced to yoga. It was scheduled into our timetable as an ad-hoc class and I couldn’t really be bothered to go but I will never forget the feeling of release and comfort I gained from that class. It was lead by my soon-to-be inspiration and guru, Chrissie Bond. (A fabulous elder lady who was forever smiling and colourfully dressed. Always so kind in nature and pleased to see her students.) Although yoga felt fairly familiar to dancing in the physical sense, it was at the same time teaching me so much more -� learning to move for the sake of understanding my body awareness and not just for the lines I was creating in a pose. Chrissie didn’t care if I was smiling properly or my make up wasn’t perfect -� she cared that I was entirely listening and focusing on my own needs for each moment I was there. I had forever been sending my focus and energy out to the world as a performance… Now I had found a way to redirect some of that focus back into myself too. It felt like I’d turned on a new sense I’d never been aware of before. As my love for yoga grew, I stumbled across the book, The Secret by Rhonda Byrne, and several other spiritual books that opened my mind to the importance and power of meditation and mindfulness, and so, I developed a habit of meditating daily. Since my interest for nutrition and fitness had not diminished I decided to enrol onto a fitness qualification course that fed me an abundance of information about the anatomy and nutrition. Now, every time I practised yoga, worked out in the gym, or was in dance class, I had so much more understanding of what was happening, how it was happening (or not happening) and why. I just wanted to keep learning and developing this passion. When I graduated from theatre school I had to move away from Chrissie’s classes as I was blessed to walk into a stream of acting work. This satisfied me in an artistic & professional sense but I felt like I had hit a brick wall with my fitness and aesthetic goals. I’d gone from dancing several hours a day with additional yoga / gym sessions to doing very little physical work at all.�I very quickly found myself spending most of my time in the gym and boxing classes for high intensity workouts, and I’d started panic dieting again. I needed some sort of goal or focus, quick. I rapidly became a regular face in the gym and it wasn’t long before I had attracted the suggestion of competing as a fitness model. I almost laughed it off but then I learnt a dancer at a job I worked at was in training to compete and she invited me to take the same journey with her. Law of Attraction right? I wanted a focus, I’d been given the suggestion and now I had the invitation. So… Saying I flirted with the idea may be an understatement… I began dating a pro bodybuilder to absorb myself into my new found world of mahogany muscle sculpting. (This was also a new venture of dating a GUY as I’d been in relationships with women for years before now. My Mum proceeded to assure me this guy was “just a phase, and I’d find a girl again soon”, love her!) I invested in some high quality training from Lee Williams – a 20 times UK Bodybuilding Champion with unbelievable scientific knowledge of diet and anatomy. I spent just a few months of extreme dieting and hard training to get to standard – weighing out everything to the gram and not even looking at any food if it wasn’t on my regime. I was used to this strict diet approach of course, so, I was good at it. I felt that people were watching this performance of discipline and transformation and on the outside I was enjoying the show. However, I was actually in the familiar habits of eating disorders and was feeling pretty imbalanced. I remember crying after eating some blueberries… “I had spiked my insulin levels so now my next weigh in would be totally off track and I sucked. My performance sucked. I’m failing. Crazy! Despite it all, I was enjoying it: I knew the disciplined plan would make my “performance” better and if I went off that plan, it would be worse. Post competition – I felt like I had been flung from the confined guidance of a water slide into a vast ocean – totally lost with what to eat, how to train, or how to control anything, so I went straight back into the “safety” of competing again. This time I was getting injured from over-training and pushing my body to dangerous levels of body fat percentage, my eating disorder was getting worse and I lost a modelling contract as my body wasn’t right for it. Argh! After the 2nd competition, although tempted to go straight back into another, I decided to find a new focus – as this obviously wasn’t working in my favour. A new boyfriend helped. (Yep, another male!) But I’m mostly grateful that I let go of some of my ego – I reduced my time with the weights and transitioned time back into yoga. Every time I got on my mat I felt that same comfort and release I had felt at Chrissie’s teaching, and slowly, I remembered how to focus on myself again. I saw how much I had utterly neglected myself for the sake of ego and trying to prove myself to the world. Yoga became my therapy. My secret weapon. And it worked. As I discovered more physically challenging styles of yoga I found it was the perfect blend for me of physical challenge and mindful focus. While it still took a couple of years to relax my diet restrictions and reduce my hours in the gym to a less obsessive nature, I now feel I’m incredibly more balanced and comfortable in many areas of life – undoubtedly thanks to the journey of yoga. Of course, the journey will continue and I’m sure there will always be things I don’t like about my body or things I wish I could change, and all that jazz. 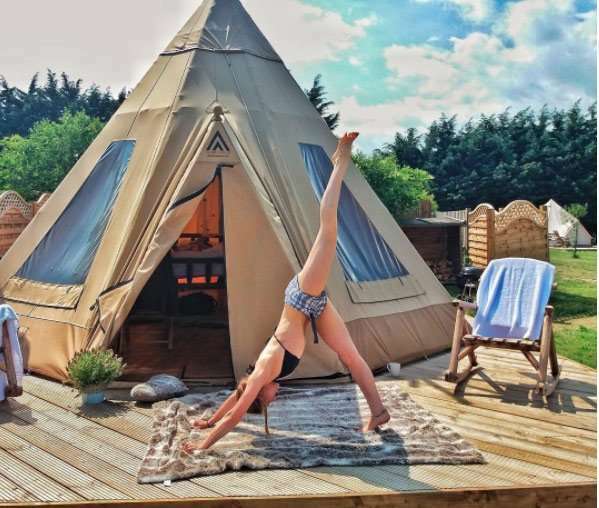 But, you know, I spent last year travelling all over the world for different occasions and things like that make me utterly grateful to not need a gym or a diet plan – you can just get your yoga on, ANYWHERE! I think we all have days where we like ourselves more than other days but really, our thoughts are all just stories – just nonsense created from external “stuff” telling us what we should look like, what labels we should have and how to be socially accepted in those labels. Taking time out from this “stuff” to refocus our attention on the truth of who we are is invaluable to keeping us balanced. Let go of your labels occasionally, whatever they may be, know that you are awesome and if there’s a tough time dimming your light, find the lesson and trust the process. “No mud, no lotus”. Thanks for reading. Do get in touch if I can help.